Objectives Exercise-based cardiac rehabilitation (CR) may be beneficial to patients following transcatheter aortic valve implantation (TAVI) and open surgical aortic valve replacement (SAVR). We aimed to undertake a systematic review and meta-analysis to evaluate the efficacy, safety and costs of exercise-based CR post-TAVI and post-SAVR. Methods We searched numerous databases, including Embase, CENTRAL and MEDLINE, up to October 2017. We included randomised controlled trials (RCTs) and non-randomised controlled trials (non-RCTs) of exercise-based CR compared with no exercise control in TAVI or SAVR patients ≥18 years. Data extraction and risk of bias assessments were performed independently by two reviewers. Narrative synthesis and meta-analysis (where appropriate) were carried out for all relevant outcomes, and a Grading of Recommendations Assessment, Development and Evaluation (GRADE) analysis was also performed. Results Six studies, all at low risk of bias, were included: three RCTs and three non-RCTs (total of 27 TAVI, 99 SAVR and 129 mixed patients), with follow-up of 2–12 months. There was an increase in pooled exercise capacity (standardised mean difference: 0.41, 95% CI 0.11 to 0.70; moderate certainty evidence as assessed by GRADE), with exercise-based rehabilitation compared with control. Data on other outcomes including quality of life and clinical events were limited. Conclusions Exercise-based CR probably improves exercise capacity of post-TAVI and post-SAVR patients in the short term. Well conducted multicentre fully powered RCTs of ≥12 months follow-up are needed to fully assess the clinical and cost-effectiveness of exercise-based CR in this patient population. PROSPERO Protocol Registration Number CRD42017084716. Aortic stenosis (AS) is the single most common primary valve lesion undergoing treatment in developed countries, and it is becoming a bigger health problem in an ageing population. There is often a period of deconditioning beforehand and slow or incomplete recovery following transcatheter aortic valve implantation (TAVI) or surgical aortic valve replacement (SAVR). Exercise-based cardiac rehabilitation (CR) may facilitate the recovery of post-TAVI and post-SAVR patients. Little is known about the impact of CR in patients with AS following either TAVI or SAVR. This systematic review and meta-analysis identified a small comparative evidence base that suggests exercise-based CR may improve exercise capacity of post-TAVI and post-SAVR patients in the short term. However, the effect of exercise-based CR on quality of life and clinical events, such as hospitalisation and mortality, remains uncertain. Although suggesting likely benefit, the results of this review indicate the need for more high-quality multicentre trials in larger post-TAVI and post-SAVR patient cohorts, with longer study periods to definitively assess the effects of exercise-based CR in these patients. Heart valve disease accounts for up to a third of heart diseases and is very common within the ageing population.1 When symptomatic, valve disease can have a significant negative effect on the patient’s ability to carry out daily physical activities and is also significantly associated with an increased risk of mortality and morbidity.2 The most effective treatment in patients with severe aortic stenosis has traditionally been surgical aortic valve replacement (SAVR).3–5 Open surgery however often leaves people immobile during recovery and in particular sternum healing,1 requiring a significant period of rehabilitation and is also associated with higher risk of complications and mortality in elderly patients.6 Transcatheter aortic valve implantation (TAVI), which is minimally invasive, is therefore usually preferred in elderly or frail patients,6 7 but nevertheless is still associated with a significant period of recovery. 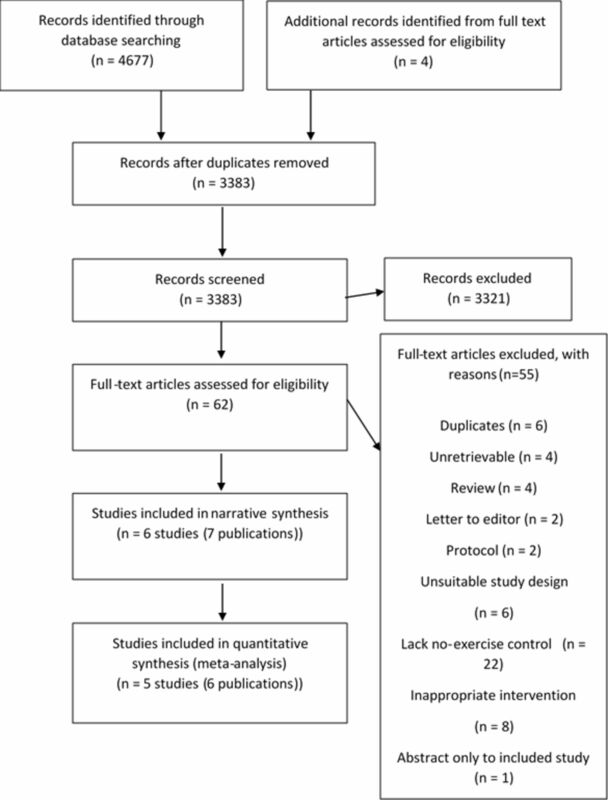 This contemporary systematic review and meta-analysis aimed to assess the clinical effectiveness, safety and costs of exercise-based CR plus usual care for patients following SAVR or TAVI, compared with usual care only. Both RCTs and non-RCTs were used, and several outcomes, including exercise capacity, were considered. This study was conducted according to the Cochrane Handbook for Systematic Reviews of Interventions16 and reported in line with the Preferred Reporting Items for Systematic Reviews and Meta-Analyses reporting guidelines.17 The protocol for this study was registered on PROSPERO before the completion of full-text screening. This systematic review and meta-analysis did not require ethics approval. Searches were undertaken using a detailed search strategy from inception to October 2017 of the following databases: Cochrane Library (CENTRAL), HTA, DARE, MEDLINE, MEDLINE In-Process, Embase, Web of Science, CINAHL Plus, AMED and PEDro (see appendix A). ClinicalTrials.gov and WHO’s ICTRP were also searched for ongoing clinical trials. Hand searching of the references of the included trials was also done. No language of publication filters or other restrictions were applied to the search. Studies for this review were considered eligible if they included: (1) adults (≥18 years) who had undergone either TAVI or SAVR, (2) who received exercise-based CR (as supervised/unsupervised, hospital based/home based, inpatient/outpatient with or without education and psychological interventions), (3) compared a no exercise control group including usual medical care; and (4) collected the outcomes of mortality, hospitalisations, health-related quality of life (HRQoL), exercise capacity, functional capacity, return to work, adverse events (safety) and cost. Studies were also included if a majority of participants (>50%) in a mixed valve replacement population were adults and had received SAVR or TAVI. Studies including patients who previously attended defined exercise-based rehabilitation programmes were excluded. Study selection was independently carried out by two authors (LA and PR), and all disagreements were discussed before contacting a third author (LL or RT) if no agreement was reached. Non-English language papers were translated. Data on study characteristics (population, intervention, control and outcome) were extracted using a piloted data collection form. Risk of bias was assessed using the revised Cochrane Risk of Bias tool for randomised trials (ROB 2.0),18 and the Risk of Bias In Non-randomised Studies – of Interventions tool.19 Assessment included: method of randomisation, consideration of confounders, selection of participants into the study, classification of interventions, deviations from intended interventions, missing outcome data (ie, level of drop out), measurement of the outcome, selection of the reported result, baseline balance between both groups and comparable care received by both groups (excluding the intervention). Data extraction and risk of bias assessment were independently carried out for the included studies by two authors (LA and PR). All disagreements were resolved either through discussion or by consulting a third reviewer RT. Grading of Recommendations Assessment, Development and Evaluation (GRADE) analysis using GRADEpro20 was also undertaken by LA and checked by LL and RT, to grade the certainty of the available evidence and therefore help inform decisions based on this evidence. A starting rating of ‘high quality’ evidence (for RCTs and non-RCTs) was downgraded by one level each for risk of bias, inconsistency, indirectness and imprecision and upgraded by one level each based on strong association, dose response and confounding factor effect. Data were processed according to the Cochrane Handbook for Systematic Reviews of Interventions.16 Outcome data were transferred into the Review Manager 5 program.21 Meta-analysis was carried out for all outcomes reported by two or more studies where pooling of the results was possible. Dichotomous data were analysed as relative risks (RRs) and continuous data as mean difference (MD) if all studies used the same measurement scale or standardised mean difference (SMD) if different scales were used. Data from latest follow-up were pooled across studies and reported as means and as 95% CIs. A fixed-effects (FE) model was used where there was no substantial statistical heterogeneity between studies. Where there was substantial statistical heterogeneity (I2 statistic >50% and p value<0.10 for χ2 test), a random-effects (RE) model was used. A fixed versus random effects model meta-analysis was done, and the results were compared where I2 statistic <50% and p<0.10, or I2 statistic >50% and p>0.10. RCT and non-RCT outcome data were not pooled, but results presented using a stratified meta-analysis. Narrative synthesis was carried out for outcomes where meta-analysis was not possible. PRISMA flow diagram showing how studies were selected for this systematic review. Preferred Reporting Items for Systematic Reviews and Meta-Analyses. Three studies22 24 26 provided CR combining both a supervised hospital and home-based sessions setting (supervised only in Jairath study), while the Pressler and Landry studies only used a hospital-based CR.23 28 CR frequency varied across studies from three to seven sessions per week, with exercise intensity individualised to the patient. Varying exercise session lengths (often not fully reported) were also used. Exercise-based CR involved aerobic exercises (walking, swimming and so on), bicycle ergometers and callisthenics (muscle strengthening exercises). Home-based exercises were either aerobics or simple daily exercises (the Sibilitz study used an exercise bicycle). Only the Sibilitz study reported a cointervention of monthly psych-educational consultations.24 See appendix B for summary of findings table. Two of the three non-RCTs had a high risk of selection bias as there was no detailed description of participant baseline demographics in the intervention and control groups.26 27 There were also some concerns with the Landry study28 as it did not explore all the possible confounders (ie, age, gender, left ventricular ejection fractio, coexistence of mitral regurgitation and number of medical comorbidities). Overall, the five included studies were considered low risk of bias (ie, had low risk of bias in four or more items). No studies reported deaths or hospitalisations. All studies reported exercise capacity as maximal oxygen uptake (VO2 max): four studies reporting as mL/kg/min and one as kj, and two studies also reported 6 min walk test (6MWT).23 24 Pooling all VO2 max outcomes across studies showed results in favour of the exercise CR (ie, RE RCT: SMD 0.41, 95% CI 0.11 to 0.70, GRADE: moderate certainty evidence; non-RCTs: SMD 0.76, 95% CI −0.26 to 1.79, GRADE: very low certainty evidence) (figure 2). Pooling only studies reporting VO2 max as mL/kg/min also showed a benefit in favour of exercise (RE RCT: MD 1.92, 95% CI −0.23 to 4.07, favours exercise; non-RCT: MD 4.59, 95% CI 1.81 to 7.37, favours exercise). Overall, 6MWT was not statistically significant between the exercise and the control groups (FE: MD 12.74, 95% CI −17.08 to 42.56, RE: MD 22.90, 95% CI −31.64 to 77.43, GRADE: moderate certainty evidence) (appendix D). Forest plot of comparison: exercise versus no exercise, outcome: exercise capacity (VO2 max) at maximum follow-up, using a random-effects model stratified meta-analysis. RCTs, randomised controlled trials. Two of the included studies reported HRQoL, using generic (12 or 36-Item Short Form Survey (SF-12 or SF-36))23 24 or disease-specific validated instruments (Kansas City Cardiomyopathy Questionnaire (KCCQ))23 scales. Meta-analysis showed that there was no difference between the rehabilitation and control groups in SF-12/36 scale mental component score (MD −0.44, 95% CI −3.43 to 2.56, GRADE: moderate certainty evidence) or physical component score (MD 2.81, 95% CI −5.82 to 11.44, GRADE: moderate certainty evidence) (figure 3). Vote counting showed HRQoL scores at follow-up generally in favour of CR (appendix E). 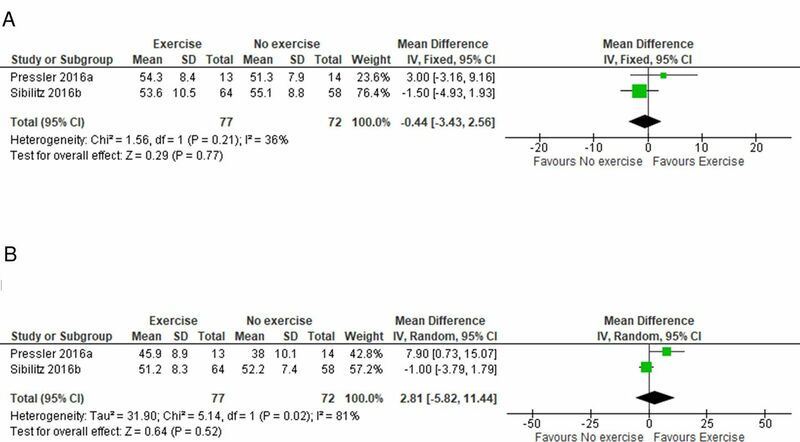 Forest plot of comparison: exercise versus no exercise, outcome: HRQoL (A) mental component (fixed-effects meta-analysis) and (B) physical component (random-effects meta-analysis). Overall, there is no statistically significant difference between both groups. Only Sibilitz reported functional capacity (appendix F). At 4-month follow-up postrandomisation, both exercise and control each had 46 patients in the New York Heart Association class I (p=0.59, 95% CI not reported). Only the Sire study reported this outcome (appendix G). At 12-month post operation, 17 of 21 (81%) patients in the exercise group and 15 of 23 (65%) patients in the control group had returned to work. P value not reported. Safety outcomes were reported inconsistently across studies (appendix H). Sibilitz reported 11/72 (15.3%) patients with adverse events in the exercise group compared with 3/75 (4%) patients in the control group. The studies of Pressler, Sibilitz and Sire reported a total of 5 out of 108 (4.6%) patients experienced serious adverse events in the exercise group compared with 3/113 (2.7%) in the control group (RR 1.65, 95% CI 0.44 to 6.18, GRADE: low certainty evidence). Sire and Pressler together reported overall drop out due to adverse events as 2/36 (5.6%) in the intervention group versus 2/38 (5.3%) in the control group (RR 1.05, 95% CI 0.05 to 22.62 [RE] and 0.21–5.11 [FE], GRADE: low certainty evidence). Only Sibilitz reported costs (appendix I) and reported no statistically significant difference in the mean total societal costs (ie, CR: €14 185 vs control: €17448, mean group difference was €−1609, 95% CI: €−6162 to €2942). This systematic review and meta-analysis aimed to evaluate the efficacy, safety and costs of exercise-based CR in TAVI or SAVR patients. In addition to RCTs, we also included non-RCTs to allow us evaluate the safety of the intervention. Our results showed probable improvement in exercise capacity in favour of the exercise-based CR compared with no exercise across the studies. However, there was insufficient evidence to comment on the impact of exercise-based CR on HRQoL, mortality, hospitalisations, functional capacity, return to work or costs. There was also not enough evidence to allow us separate out the effects of TAVI only or SAVR only. Separating these patients into the separate groups would be useful as SAVR involves general anaesthesia and thoracotomy while TAVI is percutaneous and only uses local anaesthesia. The different procedures might differ significantly in their short-term impact on patients. Post-SAVR patients might therefore respond differently to exercise-based CR, compared with post-TAVI patients. Not separating and analysing patients as distinct groups might therefore be a limitation to this study. Although this review adhered to the published protocol and to Cochrane guidelines, our study has some limitations. First, the major limitation was the limited evidence base: the number of included RCTs and non RCTs was small with a lack of consistent reporting of outcomes across studies. Second, although all studies were based on aerobic exercise training, there was considerable variation in the nature of exercise-based rehabilitation programmes across studies. Also, there were some differences in the populations (some studies looked at TAVI only, SAVR only and mixed populations). The comparator of all the studies was no structured exercise, but in the Jairath study, standard care might have included receiving guidelines for activity after discharge. Also, no study fully detailed what usual care was, and it is possible that this might differ between studies. These factors are likely to have contributed to the statistical heterogeneity seen in the review. Third, although sensitivity analysis was carried out where statistical heterogeneity could not be determined by both I2 and the χ2 p value, the review did not consider sensitivity analysis for best or worse case scenarios, with regards to adverse events.1 This could give a guide to the potential impact on our results of not including participants with events due to poor description of drop outs. Fourth, the certainty of evidence of the included studies for the outcomes measured ranged from very low to high. This is largely influenced by risk of bias assessment and sample size. Overall, the sample sizes for most studies were low and the reporting bias in the studies made risk of bias assessment and therefore its impacts on our results very difficult. In spite of these limitations, this review included up-to-date studies, and a meta-analysis was also carried out where necessary, increasing its robustness. While in Europe and the USA, patients following myocardial infarction and revascularisation and with heart failure can be offered CR; currently, such a policy is generally not the case for patients following open aortic valve surgery and TAVI.29 To inform future practice and policy, further evidence on the impact of CR following valve surgery is needed. Future studies of exercise-based CR post open aortic valve surgery or TAVI should aim to measure outcomes and costs that are relevant to the patients, clinicians and the policy makers. The studies should also aim to minimise bias and fully report all processes carried out. This would allow a more robust systematic review to be conducted, which would help inform recommendations for CR in TAVI and SAVR patients and therefore improve current practice. The results from this review show that exercise-based CR probably improves exercise capacity as measured by VO2 max. Other outcomes and safety of the intervention could not be fully appraised due to the small number of included RCTs and non-RCTs, small sample size and short study length. Further high-quality fully powered RCTs of longer follow-up are needed in order to definitely assess the effects of exercise-based CR in TAVI and SAVR patients. Such future studies should seek to collect patient relevant outcomes including HRQoL, mortality and hospitalisation. Thanks to Simon Briscoe for initial guidance with the search strategy development and to all colleagues and friends who helped with translations.
. 2014 AHA/ACC guideline for the management of patients with valvular heart disease: Executive summary: a report of the American College of Cardiology/American Heart Association Task Force on practice guidelines. Circulation2014;129:2440–92.
. Guidelines on the management of valvular heart disease (version 2012)The Joint Task Force on the Management of Valvular Heart Disease of the European Society of Cardiology (ESC) and the European Association for Cardio-Thoracic Surgery (EACTS). European Heart Journal2012;33:2451–96.
. The BACPR standards and core components for cardiovascular disease prevention and rehabilitation. 2nd edition, 2012. (accessed 21 June 2018).
. Core components of cardiac rehabilitation/secondary prevention programs: 2007 update: a scientific statement from the American Heart Association exercise, cardiac rehabilitation, and prevention Committee, the Council on clinical cardiology; the councils on cardiovascular Nursing, epidemiology and prevention, and nutrition, physical activity, and metabolism; and the American Association of cardiovascular and pulmonary rehabilitation. Circulation2007;115:2675–82.
. 2015 ESC guidelines for the management of acute coronary syndromes in patients presenting without persistent ST-segment elevationTask force for the management of acute coronary syndromes in patients presenting without persistent ST-segment elevation of the European Society of cardiology (ESC). European Heart Journal2016;37:267–315.
. AHA/ACCF secondary prevention and risk reduction therapy for patients with coronary and other atherosclerotic vascular disease: 2011 update: a guideline from the American Heart Association and American College of cardiology Foundation endorsed by the world heart Federation and the preventive cardiovascular nurses association. J Am Coll Cardiol2011;58;((23)):2432–46.
. ESC guidelines for the management of acute myocardial infarction in patients presenting with ST-segment elevationThe Task Force on the management of ST-segment elevation acute myocardial infarction of the European Society of cardiology (ESC). European Heart Journal2012;33:2569–619.
. Referral, enrollment, and delivery of cardiac rehabilitation/secondary prevention programs at clinical centers and beyond: a presidential Advisory from the American Heart Association. Circulation2011;124:2951–60.
. Secondary prevention after coronary artery bypass graft surgery: a scientific statement from the American Heart Association. Circulation2015;131:927–64.
. Chandler J, McKenzie J, Boutron I, et al., eds. A revised tool for assessing risk of bias in randomized trials, 2016, 10 (Suppl 1). Computer program] Review manager 5. RMRC. Copenhagen: The Nordic Cochrane Centre, The Cochrane Collaboration, 2014. Version 5.3 ed2014. Contributors LA led the writing of the protocol and final manuscript, carried out database searches, study selection and risk of bias assessment and conducted the Grading of Recommendations Assessment, Development and Evaluation (GRADE) analysis. PR provided clinical expertise, contributed to the writing of the protocol, carried out study selection and risk of bias assessment and approved the final manuscript. LL contributed to the writing of the protocol and the final manuscript, approved study selection and risk of bias assessment, cross-checked qualitative data extraction, provided guidance on conducting the GRADE analysis and checked/revised the GRADE analysis done by LA. MD provided clinical expertise and contributed to the writing of the protocol and the final manuscript. RT contributed to the writing of the protocol and final manuscript, approved study selection and risk of bias assessment, cross-checked all statistical analysis and data extraction and approved the GRADE analysis. All authors have approved the final article. Funding This research did not receive any specific grant from funding agencies in the public, commercial, or not-for-profit sectors. Competing interests LL is a coauthor on several Cochrane reviews. RT is an investigator on an ongoing programme of primary research in cardiac rehabilitation and is a coauthor on a number of Cochrane reviews of cardiac rehabilitation. All other authors report no relationships that could be construed as a conflict of interest. Data availability statement There is no additional data available.